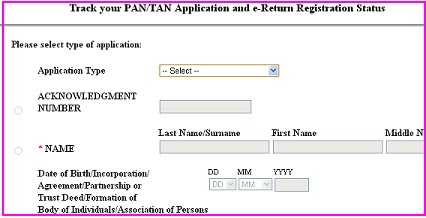 You can check status of your PAN Card application for new PAN / reprint of PAN card / Changes or Correction in PAN details using the 15 digit unique Acknowledgment Number given at the time of Application, you will find this on Application Acknowledgment Receipt after couple of days from NSDL. Applicant can check PAN card status using 15 digit acknowledgement number or using his/her name and date of birth. Check Your PAN Card Status Online By NSDL Website. We providing Direct website Link to Track your PAN Card Application Status. Kindly visit below nsdl website link to track your PAN Card application status. or Kindly visit this direct website link to check nsdl PAN Status.